Alpha Omega Wireless, Inc. ("AO Wireless") has recently hired on its team Mark Warren, a seasoned Project and Operations Manager, to bring ore efficient processes and management to our service delivery teams. Mark will take on the role of Operations Manager and is based out of our Austin, TX office location. Mark comes to Alpha Omega Wireless with 7 years construction management experience in the wireless communications sector. He has helped manage major market 3G and 4G build outs for AT&T, Sprint and T-Mobile. Mark served 6 years in the U.S. Navy as a Fleet Marine Force Corpsman where he conducted several deployments as a platoon medic with the U.S. Marine Corps. Mark is also an American Heart Association CPR and First Aid instructor and has a strong background in Construction Safety Management. 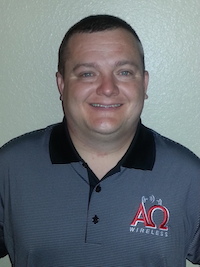 At Alpha Omega Wireless Mark is responsible for the day-to-day operations and management of all field services and staff. Mark is heavily involved in process improvement and maintaining a strong and knowledgeable staff. President Joe Wargo says, "We are excited to have Mark Warren as part of the team. He brings a lot of experience to the organization. He has extensive background in building efficient field teams and managing the processes that are critical to a project’s success. Because Mark comes from a wireless services background and has worked in the wireless industry for many years he is familiar with most of our wireless backhaul systems which is a huge advantage to our employees and clients. We believe Mark will help us be more efficient in the field and help us hold true to our processes which provides us greater success than that of our competitor. As Alpha Omega Wireless, Inc. continues to grow the need to make sure we have the right people on board and that we have the right supervision, project management, and quality control is vital. Too often companies in growth mode fail because they don’t invest into its leadership. Mark will be a huge asset in making sure as we grow we grow properly."